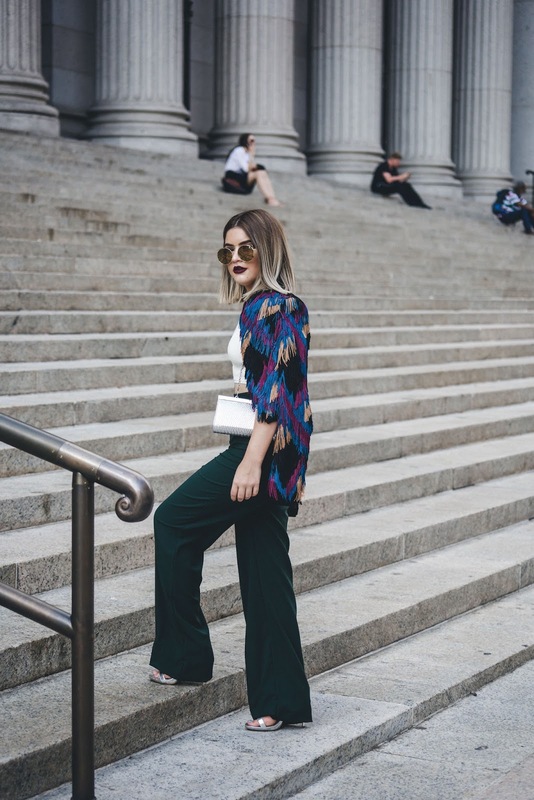 Welcome back to my second outfit post from NYFW! This definitely an outfit that was not supposed to happen. With that said, wardrobe malfunctions are always a thing you have to be prepared for (especially on a week like fashion week). I have had my fair share of unfortunate cases where something goes wrong with my outfit, and I end up having nothing to fall back on. This was the first day of presentations & events but also the first day I got into town. Shy of an hour and a half away from my first meeting, I was still in the process of checking into my hotel (with no room available at the moment - because we checked in the morning, when the actual check in time was 4pm). Anyways, with very little time to spare my photographer and I had to find the calmest bathroom in the whole hotel to transform it into our changing room. Mission accomplished: the gym! The manager of the hotel advised us to head over to the gym because it had a private restroom where no one would bother us....and so we did. Unfortunately, the first outfit I had planned to wear had a major malfunction! My stress levels were rising as I only had 25 minutes for hair, makeup, and to put together a whole new look before our ride came to pick us up. As I threw on these pants and chic white crop, I thought this was going to end up looking like a disaster.....Until, my handy dandy photographer Christine pulled out this AMAZING BCBG fringed jacket piece out of no where and told me to throw it over my shoulders as she thought it would pull the whole look together. While I did so, she started to hem the bottom of my pants right in the moment because of course (you know the constant struggle if your 5ft tall). If it wasn't for her, this look would have never come together the way it did, and I'm so happy it did! 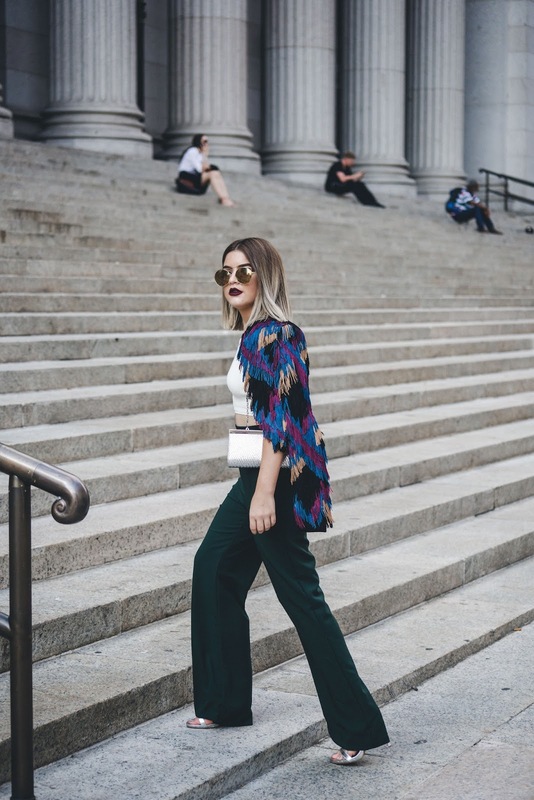 It was a major hit throughout the streets of NYFW and it event got photographed by the team at Glamour Magazine Spain & Vogue! Moral of the story, carry sewing kits everywhere, a great friend who has your back, and outfit options for every kind of situation!